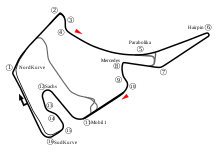 The 2003 German Grand Prix (formally the Großer Mobil 1 Preis von Deutschland) was a Formula One motor race held on 3 August 2003 at the Hockenheimring, Hockenheim, Germany. It was the twelfth race of the 2003 Formula One season and the sixty-fifth German Grand Prix. The 67-lap race was won by Juan Pablo Montoya driving for the Williams team after starting from pole position. David Coulthard finished second in a McLaren car, with Jarno Trulli third in a Renault. Montoya's victory promoted him to second place in the Drivers' Championship, after McLaren driver Kimi Räikkönen retired from a collision on the first lap of the race. Montoya also reduced the gap from Championship leader Michael Schumacher to six points. Williams reduced the gap to Ferrari in the Constructors Championship to two points. A number of cars were eliminated in a first corner pile up due to a collision with Kimi Räikkönen, Ralf Schumacher and Rubens Barrichello. This race marks the last time Williams locked out the front row on qualifying until the 2014 Austrian Grand Prix. ^ "2003 German Grand Prix". Formula1.com. Formula1.com Limited. Archived from the original on 26 December 2014. Retrieved 26 December 2015. ^ a b "Germany 2003 - Championship • STATS F1". www.statsf1.com. Retrieved 18 March 2019. This page was last edited on 18 March 2019, at 13:16 (UTC).